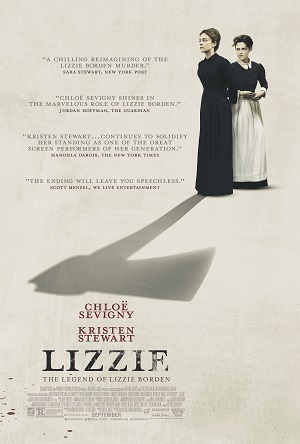 The chilling drama Lizzie is a delicately lithe, character-driven attempt to flesh out what might have lead Massachusetts homebody Lizzie Borden to allegedly murder her father Andrew and stepmother Abby with an axe back just before the dawn of the 20th century back in 1892. Although acquitted of the crime, this legendary unsolved mystery has piqued the interest of the global public for well over a hundred years, director Craig William Macneill (Boy) and screenwriter Bryce Kass attempting to put a fresh spin on the story playing up the relationship between Lizzie and her family’s maid, the seemingly mild-mannered and somewhat timid Bridget Sullivan. Starring Boys Don’t Cry Academy Award-nominee Chloë Sevigny as Lizzie, international superstar Kristen Stewart as Bridget and esteemed character actor Jamey Sheridan as Andrew, this is a mesmerizing little drama that definitely got under my skin something fierce. There are a number of stellar moments littered throughout the film, all of it anchored by performances from Sevigny and Stewart that are simply breathtaking to behold. The two actresses have extraordinary chemistry, their passionate affair having an emotional gravitas that stuck with me long after the film had come to an end. Sara Michelle Fetters: How did Bryce Kass’ script surprise you? What struck you most about what he had written? Chloë Sevigny: So I developed the project, so I don’t think I would say Bryce’s script surprised me. I produced it. There were many different versions of the script. So really for me, having done extensive research on Lizzie Borden and the murders in Fall River, Massachusetts, I really just wanted to humanize Lizzie and to make a personal movie about her. I wanted to explore the love. Having been to the home where the murders took place, which is now a bed and breakfast, the writer and I ascertained that there was no way these women couldn’t have been together, and I love a tragic love story. There are rumors of [Lizzie] having romances with other women, and I think there’s a lot of historical documentation of relationships between servants and woman in households during that time period. In this case, Lizzie and Bridget were prisoners of this household. They were all prisoners of Andrew Borden, the father, and living in his house all together, so a relationship had to be borne out of that. Not necessarily sexual, but some sort of closeness. It had to exist. This adds another aspect of the movie in the form of the tragic love story and the fact people so often have dangerous experiences when falling in love. That somebody else can provide a certain amount of freedom, or happiness, or security, stuff like that. I think Lizzie experiences that. Lizzie thinks that if she and Bridget are together life is just going to be hunky dory. I wanted to explore that as well. Sara Michelle Fetters: What was it about Lizzie’s story that captivated you and just kept you this inspired? Had you wanting to explore this story in such detail? Chloë Sevigny: I’ve been continually fascinated with her, but when we first set out to make the project, it was quite a while ago, and then the property, it went to another studio. So we had to fight to get it back. But that’s just part of the business. It wasn’t like I was every day trying to get this movie made. There were long periods when I was doing other stuff, other TV shows and movies. But it cycled back into my life at the right time. We got the property back and within a year we’re releasing the movie. So it was more waiting for all of that to happen. 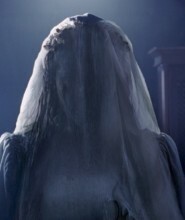 But I think to me, there’s already a captive audience for Lizzie’s story. People want to know about Lizzie, just look at the other TV shows, movies, plays and operas that have been made utilizing her story. This woman has captivated American audiences for a very long time. Sara Michelle Fetters: What I really liked about the movie is was the way that you humanized this situation. We really do feel that intense pressure that, not only is Lizzie feeling, or that Bridget is feeling, but her sister, Emma, is forced to deal with as well. You can just really feel this smothering on Andrew’s part and how it is affecting every member of the household. Chloë Sevigny: Yeah. I think that’s right. Even the step-mother. I think they’re all prisoners in this house all together. Sara Michelle Fetters: Why was it so important for you, Bryce and Craig to pass that feeling of being trapped, of being smothered by Andrew, onto the audience as completely as you do? I don’t think I’ve seen about Lizzie Borden that’s emphasized this element of her story to such a degree before. Chloë Sevigny: I think that that’s the big reason why Lizzie committed these heinous acts. That she had no options. She was really oppressed and repressed, and there was nowhere for her to turn. I think a lot of women still feel trapped and have very limited choices. We don’t want to condone violence, obviously, but we did want to shed a light on abuses of power. Sara Michelle Fetters: Talk a little bit about the relationship between you and Kristen. How did you two develop that intense, almost wordless chemistry? Chloë Sevigny: I think we’re really both really good at acting without dialog. I think we both just have that ability. For me, I can just stare endlessly at her, there’s so much going on behind her eyes. You can always see her thinking. I think that she’s one of my favorite actresses because, knowing her as a person, and even before I knew her, you can tell she’s a very authentic person. She brings that to Bridget. It comes across in her performances. Kristen’s not holding anything in. She doesn’t want anything to ring as phony baloney, for a lack of better words. There was a mutual admiration between us over our choices, about who we are and what we represent. And, yeah, I think we just really liked each other. I think that is the bottom line. Sara Michelle Fetters: With this being an independent production without a ton of financial resources, was there time for you two to rehearse? Did you even want time to rehearse? Or did the two of you just figure out how you were going to interact when you got to the set? Chloë Sevigny: We were working around her schedule, around her availability, but Kristen came to Savannah and was there for the whole duration. Because of that we had a few days before we started shooting that we were combing through the script, going over every line, every nuance, and anything that she was curious about. We worked on it all because we knew that on the day of shooting there wasn’t going to be a lot of time. But then, even on those days, she wanted to explore and do other things, and when you have a great actress like Kristen you want to give her that time to put that out there. That’s not difficult. You’re excited to have that. When you have someone that’s going to deliver, you want to give them the space to do just that, and Kristen continually delivered. Sara Michelle Fetters: Then there are those scenes between you and Jamey Sheridan. There is this tension between the two of you that is there right from the start. How was it that you were able to just make that feel so uncomfortably palpable? Chloë Sevigny: I think a lot of that was on the page, going back to what you said about when you receive the script, so that was already there for us. It is also the crux of the story. We wanted to really hit that home, and Jamey was a team player. I think he was excited to take on this patriarchal figure and make him so complex. I appreciate everything he brought to the performance and to the part. Jamey didn’t want Andrew to be this tyrant. He was like, no, that’s just not the way it’s going to be. He is very quiet, very intense, very methodical, all of which is almost scarier than having him get loud and go big. I think that is really what he does with the part, makes Andrew his own like that, which to me is more interesting than someone who could have been just flying off the handle all the time. Keeping it quiet is freakier. Sara Michelle Fetters: Looking at the caliber of actors you were able to get to be a part of the film, were you at all surprised they came aboard? Fiona Shaw, Kim Dickens, Denis O’Hare, these aren’t big parts yet they are still given the freedom to make the most out of them. Chloë Sevigny: It didn’t surprise me. I think they all wanted to support the film. I think there’s so few films out there that I think can talk about social injustice, speak to what is going on in society right now, and yet also entertain. I think it just felt like an important story that they wanted to be a part of telling. Dennis and I have worked together on “American Horror Story,” so we already had a relationship, and Fiona Shaw had worked with Craig on “Channel Zero” I think, do they also had a relationship. And Kim Dickens had worked with one of our producers, so there was that relationship, too. A lot of it was just us calling up people that we knew and hoping that they would find something in the script that they found compelling so they would want to be a part of telling this story. Everybody came out and gave us their time. It was so generous. And, personally, I just love watching Denis. He’s so creepy! Sara Michelle Fetters: I don’t want to reveal anything, but I’m so glad you say that. The two key scenes you two share together, the way they sort of bookend the core parts of the narrative, you two are just superb in those moments. Chloë Sevigny: Thank you! Denis is just so great. He’s a generous actor. I loved doing those scenes with him. Sara Michelle Fetters: I know we’re out of time so I’ll just ask one last quick question. What do you hope people are talking about when the film comes to an end? Chloë Sevigny: I think it’s a beautiful story about women who are trapped and oppressed by men. Lizzie fights back against the status quo. She’s an outlaw.